The Net.Culture.Lab is an innovation initiation by Telekom Austria. At the 2 year celebration of the innovation labs for net culture, present achievements and achieved goals were celebrated. The results of the idea competition were presented and new planes were introduced. MOTIONLAB was assigned to do the projection design, content design based on the existing CI and the execution on the event itself with speakers, presentations, teasers and multiscreen content. 3 midi triggered Edirol V4 and a frame synchronized mediaserver makes it possible to play multiscreen video content on time. 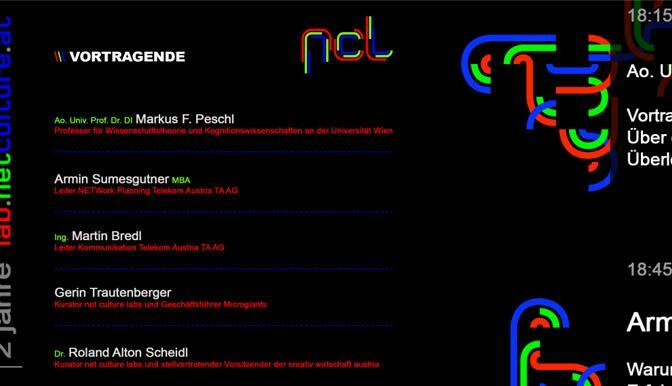 The list of lecturers – a who is who of the Net Culture Lab. Videos and slideshows were shown – implemented in the CD.